These fabulous flavors combine in a skillet to make an amazing, fresh and ‘light’ weeknight dinner. Also, I highly recommend the fresh basil garnish on this. Yes, the little packets of leaves are expensive (hint: grown your own…it’s super easy!) But in this kind of meal, the fresh flavor is key! In a large skillet, add the olive oil and saute the chicken breasts for 2 to 3 minutes. Sprinkle the balsamic vinegar and cherry tomatoes around the chicken and saute for 5 to 7 minutes, stirring and flipping chicken often. 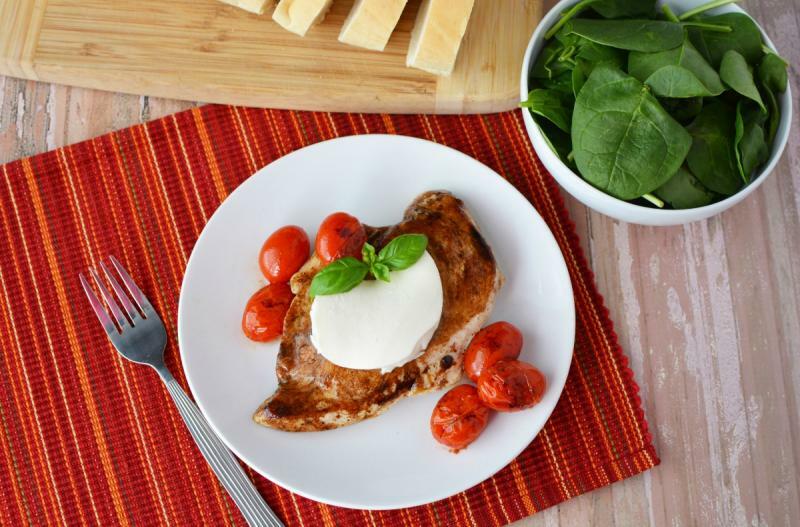 Once the chicken has cooked through, add slices of fresh mozzarella cheese and fresh basil over the chicken and sauteed tomatoes. Prepare the salad. Warm the loaf of bread. 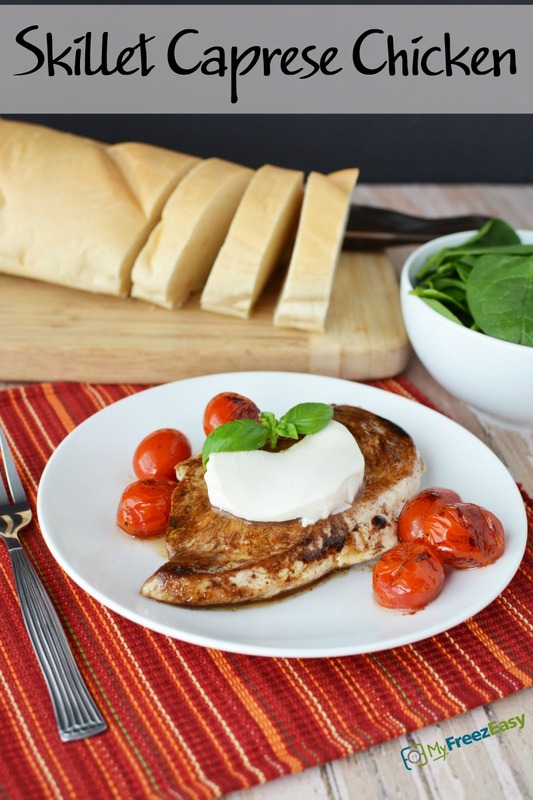 Serve Skillet Caprese Chicken with salad and bread. Put baggie in the freezer and freeze up to 6 months in fridge freezer or 12 months in a deep freezer. Thaw in the fridge overnight, or a warm bowl of water for about 20 minutes. Transfer all of the content from the freezer bag to large skillet or saucepan, start to cook over medium low heat, stirring and flipping the chicken often. Thaw and add to skillet to cook over medium low heat stirring and flipping often. Saute until the chicken is cooked through, about 8 to 10 minutes. Add fresh mozzarella slices and fresh basil as garnish.